BROWNSBURG, Ind. (December 10, 2015) – Rahal Letterman Lanigan Racing (RLL) announced today that Steak ‘n Shake, a classic American brand and home of the original Steakburger™ and hand-dipped milkshakes, will return for a second season of sponsorship after a successful partnership in 2015. Steak ‘n Shake will be the primary sponsor of Graham Rahal’s Honda entry at five 2016 Verizon IndyCar Series events including races in St. Petersburg, two events at Indianapolis Motor Speedway, Mid-Ohio and Sonoma. Maxim Magazine branding will continue to be prominently featured on the race car. Both are owned by Biglari Holdings Inc.
“We are absolutely excited about extending our partnership with Rahal Letterman Lanigan Racing for the 2016 IndyCar series,” said Sardar Biglari, Founder, Chairman and Chief Executive Officer of Biglari Holdings Inc.
Steak ‘n Shake began their racing involvement as the primary sponsor for six races at five venues in 2015 as well as an associate sponsor for the full season. The company added primary sponsorship for the penultimate rounds of the season to support Graham Rahal’s championship bid. The sponsorship featured elements like an exclusive Steak ‘n Shake bow tie-themed fire suit, in-store fan events and social media engagement. 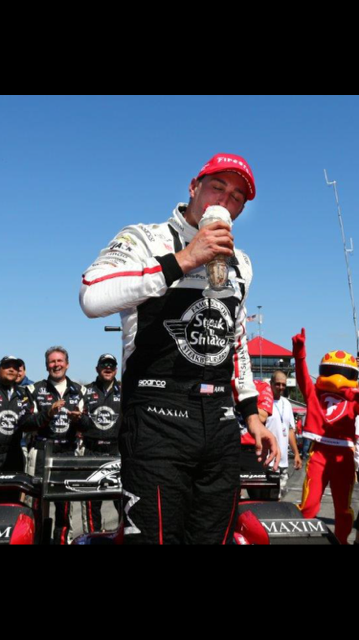 Graham also created a signature Steak ‘n Shake milkshake, which he drank after each podium finish during the season. The 2016 Verizon IndyCar Series season begins on March 13 with the Firestone Grand Prix of St. Petersburg which will be televised live on ABC at 12:30 p.m. ET. The season consists of 16 events and includes a return to historical venues, Phoenix International Raceway and Road America, as well as an inaugural event in Boston. Steak ‘n Shake, a classic American brand, serves premium burgers and shakes in more than 500 restaurants across the country and the world. Founded in 1934 in Normal, Illinois, Steak ‘n Shake is the leader in the “better burger” segment of the restaurant industry, serving hand-crafted, premium Steakburgers and hand-dipped milkshakes. Steak ‘n Shake is the recipient of the Nation’s Restaurant News Golden Chain Award. Zagat has recognized Steak ‘n Shake as having the No. 1 Milkshake. Steak ‘n Shake Inc., based out of Indianapolis, Indiana, is a wholly owned subsidiary of Biglari Holdings Inc.
Maxim Magazine is one of the largest men’s lifestyle magazines in the United States and internationally. The company is based in New York, New York. Maxim Inc. is a wholly-owned subsidiary of Biglari Holdings Inc.
Rahal Letterman Lanigan Racing, based in Hilliard, Ohio and Brownsburg, Ind., is co-owned by three-time IndyCar Champion and 1986 Indianapolis 500 winner Bobby Rahal, former CBS Late Show host David Letterman and Mi-Jack co-owner Mike Lanigan. In 2016 the team will compete in their 25th year of open-wheel competition and attempt to add to their 22 wins – including the 2004 Indy 500 from pole with Buddy Rice — their 29 poles, 87 podium finishes and 1992 series championship. The team also competed in the American Le Mans Series from 2009-2013 as BMW Team RLL where they won both the Manufacturer and Team Championships in the GT category in 2010 and swept all three GT titles in 2011 – Manufacturer, Team and Driver. In 2012, the team finished second in the Team Championship and third in the Manufacturer Championship and in 2013, the team finished second in the Driver, Team and Manufacturer Championship. In 2014, BMW Team RLL moved to the GTLM class of the TUDOR United SportsCar Championship with a two-car program and earned six podium finishes including four second-place finishes. In 2015, the team earned three wins, two poles and a total of eight podium finishes to finish second in the Manufacturer, Team and Driver championships.